Artist’s impression of Whitehorse Road looking west. The Whitehorse Road streetscape improvement works are scheduled to commence 21 January 2019 and are expected to take 10 weeks, weather permitting. 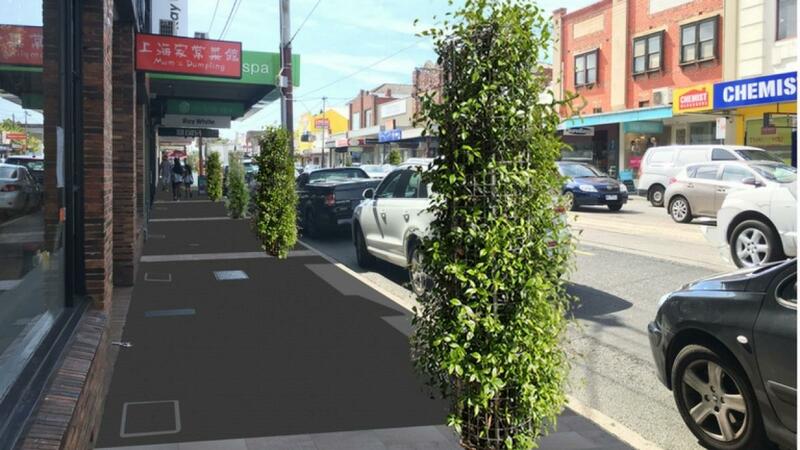 Works will take place on the northern side of Balwyn Shopping Centre, between Balwyn Road and Brenbeal Street. Council sought community feedback on the proposed improvement works in May 2018. The improvement works will include upgrade of the footpath pavement, installation of new climber frames, planting and feature banding, and upgrade of the existing pedestrian fencing. The design vision is to improve pedestrian amenity by creating an attractive, clutter-free and functional environment that maximises social, economic and environmental outcomes. improved streetscape amenity with new furniture, such as new seating, bins and bike hoops and greenery to soften the appearance of the shopping strip. Pedestrian access to shops will be maintained during the works. Parking adjacent to the work area will be restricted as required to ensure works are completed safely. Construction works: Please contact Cid Mariani on 9278 4524 or Masha Patikirikorale on 9278 4541. Project: Please contact Richard Thomas on 9278 7832.